I am writing to you to inform you that for the past twelve hours there has been no water supply in my apartment. As a tenant with family, I expect these simple facilities to be working at all times. This is a major inconvenience for me and my children. I request that you fix this issue as soon as possible. I am writing this letter in regards to the quality of water in the housing society. I have concerns about the quality of the water. As of late, the water has an extremely strange smell and has had detrimental effects on my family’s skin. I have noticed that this may be due to the extremely high salt concentration which is causing dryness of the skin. The water itself has a slight brownish tint, which makes it difficult to wash clothes with. I urge the Government Housing Society to have the water supply tested for any toxins or other issues which may be causing the recent changes in the water. If any are found, please treat the water or switch the water supply immediately as this is a major health hazard. With all due respect I am writing this letter to inform you about the condition of the water services in our society. We have been facing much trouble since a month because we have not been getting proper water supply. In the morning when my children and husband are getting ready for their school and office there is no water. Even when we do get water it is very unclean and unhygienic. It is difficult to take showers because one minute there is water and the next minute it is all gone. The water supply issue is becoming a hurdle for us since we are not able to wash our clothes and clean our houses. We have to pay extra amounts for water tankers which are very expensive and problematic. I talked to my neighbors and other society members and they have been facing the same problem. I hope this issue will be brought to notice by the council and will be resolved soon. Write letter on reply of shortage of computer in supply as a manager of company. I am writing to you because I would like to make a request. As the company director you have the responsibility to make sure that your company has all of the equipment that the employees need to keep the profits high. So on this topic I am requesting that you get this company some computers due to there being a shortage because of the recent recruitment over the past week we now have more employees than computers. If we get the amount of computers that we need then I can assure you that we would be able to hit the daily target and more we would be able to make more profit and make the record. I hope that you listen and get the computers soon and I look forward to hearing back from you. Request letter for material supply. sample letter of request for materials needed. sample request letter for building construction. I am writing to you because my construction team is on a deadline and if we keep going the way we are going using our current materials and machinery we will keep getting delayed. I would like to request that you give us the appropriate equipment that we need so that we can move ahead and meet out deadline. We need diggers and tar mac rollers. We also need more fencing as the area we are doing construction is big and we don’t have enough to cordon it off to the public. We could also use some more tar mac and concrete. I hope that you can give us what we need. I’m writing this letter so that I can request you to deliver my construction material soon on the location. I know I have ordered the material for next month but I need that early, as I’m going out of town for almost a month. And won’t available on that date of delivery. I shall be highly obliged. Sample letter requesting the delivery and supply of medicine on time because we are out of medicine. I am writing this letter to ask you for a redelivery of B type medicines as soon as possible. Since the outbreak of cold flu the B type medicines are being purchased at a very rapid rate. I know that I was delivered a lot in the last week but due to increased demand I have now run short of B type medicines. I would like to request you to kindly redeliver two lots of the medicines as soon as you can. We have lives at stake here. I hope you will approve my request and deliver my medicines as fast it’s possible. Attached is the list of medicines I am requesting you of. Sample request letter to get permission for supply of raw material for construction, production, repair on plant, factory etc. I am writing this letter to inform you that you have signed a contract with a supplying company but unfortunately the owner is closing his business and he has referred me for your company, I have talked to the manager and he has allowed me to supply raw materials to your firm. I want a written permission letter as it’s an official need. Please mail me the letter as soon as possible as I have to supply the material on the given dates. Thanks. It is requested that our company deals in pulp used in tissue paper manufacturing. We provide pulp to 40% of the total tissue manufacturing companies in Ohio. The standards of ISO 9001, ISO 9004 and ISO 12675 are fulfilled by the company as its first priority, that is why there is no single complain about the pulp provided by our company. Moreover the discount of 10% is also given to customers with good repute. Please allow our company to supply pulp as raw material to your company for the production of Tissue papers in your factories. I hope you will reply with a positive response. Format of sample request letter for supply of goods to the supplier, distributor, manufacturer on cash or credit delivery. This letter is used in businesses for exchange of goods, ordered goods for delivery on retail stores, franchise, dealers, showrooms etc. It is to inform you that the contract agreement for the supply of electric and water supply items has been concluded and finalized against your lowest bid. In this context your supply order has already been issued to you to supply the store accordingly. Writing this letter is meant to please arrange the supply of the store at the earliest as same is urgently required by our organization for its on going projects at different levels. An early action will be highly appreciated please. We request a supply of four tons of packing paper. We require plastic packing paper of 0.67 gage and width of 5 meter. This is required to pack and palletize our food items. This plastic paper should be provided in rolls of four with one ton weight. You may send such supply to our factory of which freight charges would be paid by our company. We require such supply within two weeks as we have an order pending for next month. We have agreed the price of 2000$ per ton. 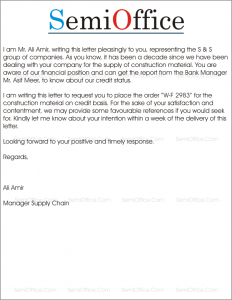 I am Mr. Ali Amir, writing this letter pleasingly to you, representing the S & S group of companies. As you know, it has been a decade since we have been dealing with your company for the supply of construction material. You are aware of our financial position and can get the report from the Bank Manager Mr. Asif Meer, to know about our credit status. 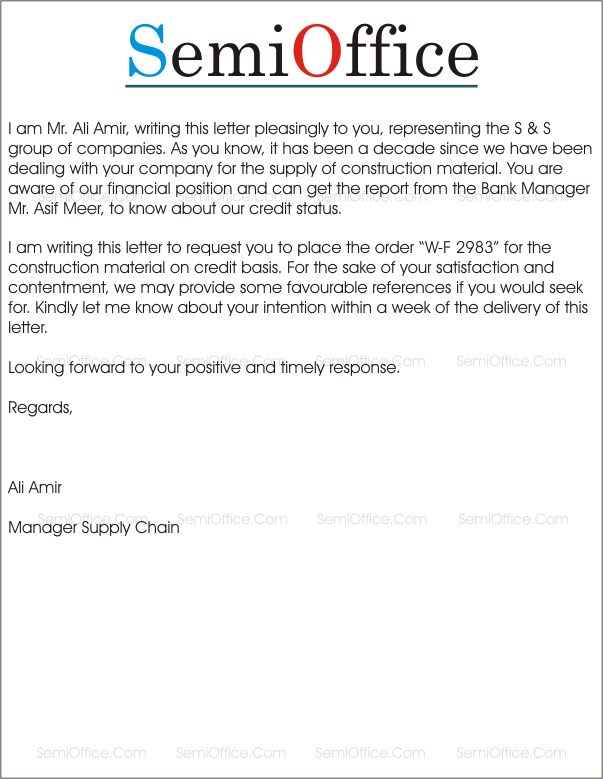 I am writing this letter to request you to place the order “W-F 2983” for the construction material on credit basis. For the sake of your satisfaction and contentment, we may provide some favourable references if you would seek for. Kindly let me know about your intention within a week of the delivery of this letter. I request you to kindly deliver me the invitation cards I had ordered fifteen days ago for my brother’s wedding. I was supposed to receive the cards within 10 days of the order but it has been nearly a week late that I was supposed to receive the invitation cards. I am enclosing a photocopy of the order receipt with this letter. Kindly send me the invitation cards within 2 days i.e. by 27th July, 2015. My brother’s wedding is scheduled for the mid of August and the cards have to be sent out to the guests as early as possible so that they can timely make arrangements for their arrival at the wedding. The Card Company has always produced the best cards both in quality and in design. I am sure that the company will live up to its standard and provide me with the best services in time. Kindly take a prompt action in this regard. Thank you.